Unity Gardens: Ravina Park Grand Finale! South Bend Fire Dept waters the Unity Garden & the kids! Veggies for salads! No left overs today! Our URC LAMP kids program at Ravina Park has ended for this year! This program was made possible with collaborative partners: Neighborhood Resource Center , United Religious Community, IVY Tech, South Bend Parks Dept, and area neighbors! On Wednesdays and Saturdays neighbors and friends gathered to eat and play together. On Saturday garden programs were held, raising awareness and appreciation for veggies, harvesting, and planting. At first many were tentative, not wanting to eat things right from the ground. By today, even the youngest participants were enjoying their own salads and waters! But as usual, we were not only celebrating healthy eating, we were growing something more! We enjoyed meeting neighbors who wanted to hear about how to get more involved with Unity. It was great to introduce them to the firemen, other garden leaders and many of their own neighbors! I was amazed to note that we had 6 different Unity Garden leaders at this celebration, supporting one another in their "growing" efforts! All were sharing their stories; Laureen about the sudden influx of harvesters throughout her Madison Square Unity Garden, Rey discussing the successes Monroe Park has enjoyed, now in the 3rd season, and Tina, who helps keep the harvesters at LaSalle Square from going hungry when we have no more to pick at her nearby Garden of St Therese. Heather shared ground hog tips with Ricky, who has a recent unwelcome harvester lately! As I hear these and others share their visions of Unity, it is evident our community has truly come together in amazing ways to grow health! 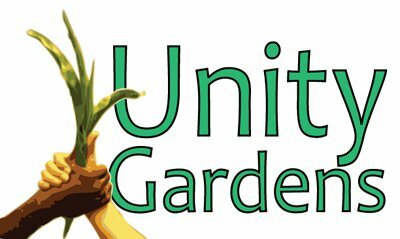 Thank you all for supporting Unity Gardens and each other!